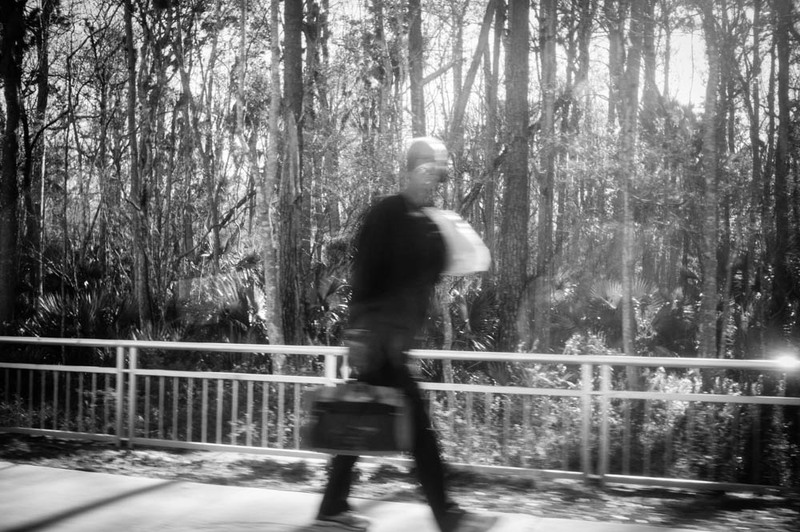 Bigfoot with a briefcase. I don't know. Maybe. Shot from the window of a speeding car on the way to work. I was wrong about having better images in my camera. Just more of this. It is a shame. The rain began to fall last night. No sun this morning. Gray. My ribs and shoulder hurt all night, and perhaps this is why. My hips hurt, too, and I wonder just how much I'll fall apart in the coming days. My friend tells me he is retiring and is going to walk through Europe for two months, and I am unsettled. Would I be able to do that now? I walked to lunch with Ili yesterday, just a one mile trip and back to the far end of the Boulevard where we sat outside and had brunch. When we came home, I was done. I'd rather be writing about some guilty glory. Ili and I have watched two old t.v. shows in the past two evenings--"Adventures in Paradise" and "Sea Hunt." We've enjoyed them immensely. Why don't they make shows like those any more? They are improbable and corny, but they are romantic and lovely, too. You probably couldn't sit through them, but they inspire us to go out and find old places not so obviously touched by the present. You know, Trump Country. Places where people don't want any intruders coming in and telling them what to do. Places where people just want to be left alone on their five acres of land with a semi-tractor trailer parked on the lawn. I used to watch a t.v. show in the early '70s called "Quest," I think. I can't find it. It, too, was about a skin diver. I loved adventure as a kid, as you well know. I want to continue swimming up waterfalls and wrestling grizzly bears. I'm trying. Much healing, still. Until then, "Adventures in Paradise" will have to do. There was a character in the episode we watched called One Arm. That is what Ili is calling me now. You can't call people things like that now. It is too bad. The world becomes so bland. For now, this is your reporter signing off--Old One Arm.